I have been with the AM Roofing family since 2014; I strive to make your experience with AM Roofing a positive one. Please feel free to contact me at the Guelph Office any time. 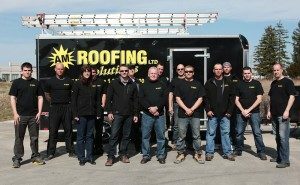 I joined the AM Roofing family in 2014 bringing extensive Customer Service experience. I would be pleased to answer any of your questions, and help connect you with the right AM Roofing staff member. I have been in the roofing industry for over 30 years and have had the great opportunity to become the top Consultant for AM Roofing. I am pleased to educate my customers to be value driven and not price driven. I have been married for 28 years and am the proud father of two awesome children. Both my wife and I are members of Creekside Church and volunteer at the Ray of Hope in Kitchener. My hobbies include woodworking and re-finishing Waterloo County Primitive furniture and going to auctions. I am proud to work for an organization that cares about its customers. AM Insulation Solutions’ employees work full-time, are employed year-round, receive company benefits and WSIB coverage making them unusual in an industry filled with seasonal companies and temporary workers. Our approach assures that our people continuously meet our high-quality workmanship and safety standards. 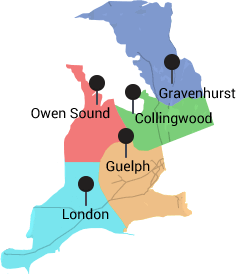 Our Guelph office services Guelph and several surrounding communities including Kitchener-Waterloo, Fergus and Cambridge. Our office was originally located in Fergus but was recently moved to Guelph to better service our growing market area.